Sponsors provide great value to our ICG Members. Find them below. As we close out another year, the ICG has much to be thankful for. We have seen an increase of roughly 15% in our membership numbers and almost double that in Sponsors. Our new website has not only stabilized our "virtual home", but with our multilingual forums brought an upswing in our International Member participation. The ICG Fitiing Certification is completed, and will be our first Certification offered on our new contract testing software. We are finishing up the links giving access to the written exam and will be offering this new ICG Certification to our membership pre-show in early January. 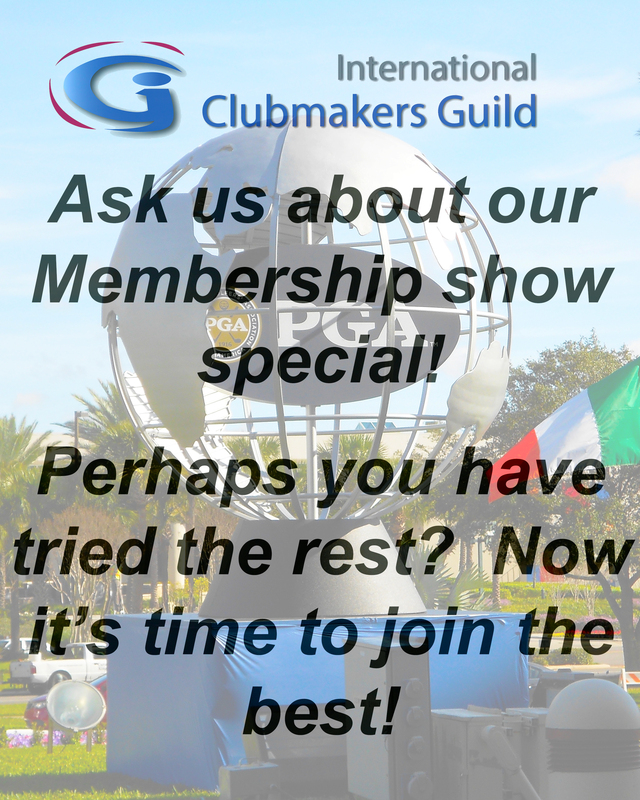 The PGA Show, well if you have kept up with the forums and our dynamic Social Media upgrades this year, you know it is going to be a must attend event! We have sold out the available slots for sponsor participation more than doubling last years numbers. Our new meeting room and our location on the Demo-Day event are truly incredible. If you haven't yet you should check the forums giving the location of both. Being next to Flightscope, Taylormade, Adams and the like on the Demo Range is huge! I do a lot of Demo Days and can tell you firsthand, neighborhoods count at these events and we are in a good one. The BOD's last meeting of the year was this week. As reported all year long, the ICG is financially strong. Our bank balances remain +\- within a couple thousand dollars of when this BOD took office last April. That may not sound impressive as a stand alone statement, but consider that includes the cost of a new and professional website, an upgraded "event" at the PGA Show, and our Social Media push. All paid for, and each one bringing in new Members and Sponsors. Yes we have a lot to be thankful for. I know I am thankful for the honor of serving as your president, for each and every member we have, and for the opportunity to work with the truly dynamic people on this Board of Directors. The Fitting Examination is comprised of two parts, with the goal being to ensure a thorough knowledge and application of fitting metrics. The written examination, taken online with a 4-8 hour time limit, is a 100 question test. The questions are sourced from commonly accepted books on fitting, our sponsors, webinars, and will include fitting case study questions. Successful completion will require a thorough knowledge of all of these parts. 80% is required on the written, for those scoring 75-79%, an extra credit question will be emailed to you with a possible of up to 5 points available to reach the needed 80% passing score. The second part or practical will be assigned by the Fitting Certification Board. The assignment will be made after completing the written portion. It will require all Launch Monitor data, media and narrative of the assigned fittings. Your submission will be evaluated by the Fitting Board and assigned a pass/fail grade. Sign Up today and get certified! The first four ICG members to become ICG Certified are Jacques Intriere, Eddie Smith, Gerald Friz, and John Dranshack. 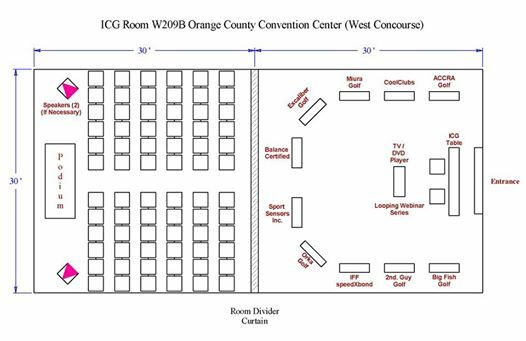 And in Room W2009B for the PGA Show (see schedule and room layout below). Special thanks to Frank Viola for coordinating with Reed Exhibitions and our sponsors making this all possible! 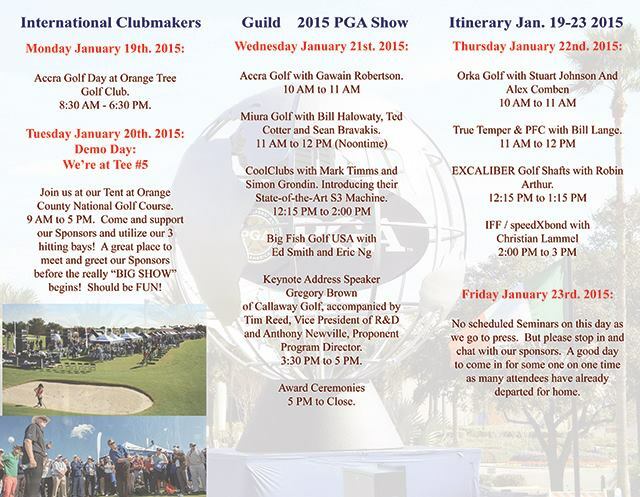 "Scottsdale, AZ - Cust club fitting giant Cool Clubs has announced that it will be at the 2015 PGA Merchandise Show in Orlando, FL January 21-23. Cool Clubs will debut their new game-changing S3 shaft testing machine. The S3 is the first of its kind to measure and analyze multiple parameters of a golf shaft on a single machine. In roughly two and a half minutes, the machine will analyze a shaft's straightness, consistency, deflection and stiffness profiles, frequency, and torque." ACCRA Golf Shafts will be introducing a new line of shafts called the Fx Series at the PGA Show. Designed specifically for the world's best club technicians, the ACCRA Fx Series of shafts offers 3 distinctive flight patterns enabling Club Technicians to dial in weight, flex and launch conditions to perfectly fit every golfer. To create the Fx series of shafts, ACCRA engineers used only the highest quality of materials to ensure quality, performance and feel. Each model of the Fx Series has been independently engineered using ACCRA’s exclusive DyMatch technology offering golfers the ability to perfectly match their woods and hybrids dynamically. The ACCRA Fx series of shafts will appeal to all levels of golfers from discerning golfers looking for a shaft to aid in launch and forgiveness to Touring professionals requiring stability and feel. ACCRA’s DyMatch Technology is combined with a new S3 design, higher modulus materials, lower resin content, tighter tolerances from superior Japanese manufacturing all to create the best “DyMatched” line of shafts in history. Make sure to drop by the ICG booth to get a first look at the new line! Big Fish Golf USA is looking to invite highly qualified Fitters/Builders to join our team in the U.S. and Europe. Here are few reasons why you should take a look at Big Fish Golf for 2015. Following the success of the CB 003, the CB 005 is designed using the latest CAD-CAM technology, where the sweet spot, CG and perimeter weighting are incorporated with pinpoint accuracy. Employing high-speed CNC milling methods, the production method is so precise that we are able to get ultimate precision weight, dimension and finishing. Golfers playing the BFG CB 005 will experience how great design incorporating D-plane application, simple lines and stringent manufacturing processes has resulted in crowning a new King in the BFG lineup. Our superb design combined with controlled manufacturing processes allows for the production of precisely weighted heads, which provides fitters iron heads that are easy to fine tune and match. We offer two distinct versions: the CB-005 and the CB-005J. The CB-005 is a more traditionally weighted iron series, available from 3-PW set configurations. While the CB-005J, available 5-pw, is the lighter version and are typically used by juniors, women, lower swing speed golfers, or those who prefer lighter weighted irons. Seemore Putters and SpeedxBond sent us PDFs which we've put in the resources library of our member's only section. QualityGolfStats, LLC is proud to announce exciting updates to OptimalFlight. It introduces world exclusive CURVE ANGLE metrics for your driver ball flight optimization. It tells you exactly how much the flight is curving and what to do to bring it more on target! In addition to these updates, OptimalFlight now features integration with OptimalStrike. It is the world's most insightful and powerful impact analytics tool. If you liked the what-if features for ball flight, you will love these features for club + ball impact! OptimalStrike's world premiere is February 1, 2015 and will be available as a FREE tool anyone can use. They say it couldn't be done... The breakthrough discoveries via OptimalStrike are transforming the PGA's 5 ball flight laws to a simpler and more powerful concept that every golfer needs to know. Contact info: [email protected]. The XP Series features super light designs engineered for maximum distance, putting explosive power in the hands of any golfer. Robot and player testing have shown an average of 6-8 yards improvement in carry distance, with many players seeing double-digit yardage gains. The XP Series features three models: XP 95, a super light design, XP 105 for slightly faster tempo swingers, and the new XP 115, an excellent choice for stronger swingers who want a mid-ball flight. Visit True Temper at tee #4 at Demo Day and booth #1101 at the Show to learn more. You'll be able to take advantage of this one week special (January 17 - 24) by either inquiring at the Show or by logging online and viewing it at your member landing page. You can learn more about these and other sponsors and others by going to our Featured Sponsors page. Webinar clips are available for guests, and links to the full webinars are provided for ICG members. Well that's it for our final preview of the PGA Show. Look daily next week for plenty of pics and news on our Facebook stream (right hand side of our web site), a great followup newsletter, new videos and webinars on our web site, and more great clubfitters and clubmakers joining (check our growing Google Maps). Safe travels and see you at the Show or online at www.clubfittersguild.org .